Ahhh that fresh feeling you get as you sit in Adventureland enjoying your favorite frozen snack, the Dole Whip…. as I sit next to you eating my citrus swirl. The Disney Company entered into a partnership with the Dole Company around 1976. So despite what some think, the Dole Whip was not at the opening of Disneyland or Walt Disney World. Today the Dole Whip and the Tiki birds go hand and hand to the point that a rumor of Dole removing sponsorship of the attraction caused phones to light up at both Disney and Dole headquarters. Today we eat about 1.4 million Dole Whips just in the Disney Parks each year and dare I say that Dole Whips have also found their way outside the parks as well. Today you can find Dole Whips at State Fairs, Zoo’s, other Theme Parks, and even at our favorite spot, the Dole Plantation in Hawaii(pictured above). And, did you know, if you have your own soft serve machine at home you can order the Dole Whip Mix from United Enterprises. 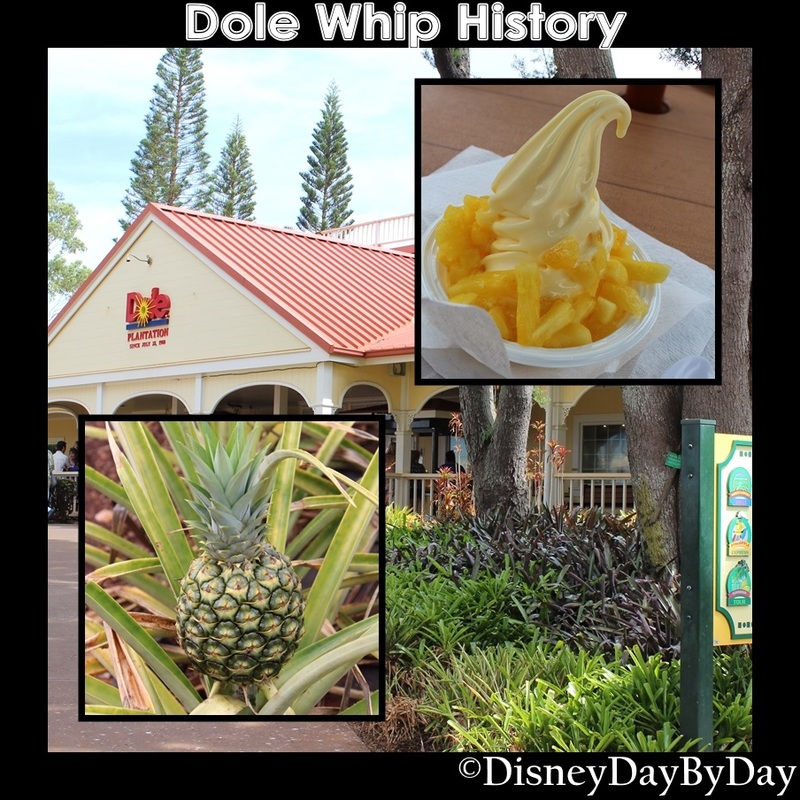 For those of you who love to enjoy your Dole Whip with Disney here is where you can find them. Polynesian Village Resort – just outside the Great Ceremonial House you will find the Pineapple Lanai, but no longer are you allowed to create your own and challenge to see who got the most for their money. Tokyo Disney Resort – Mango Soft Serve, but No Dole Whip here. Disney Cruise – Mickey Ice Cream Bars a plenty – but not a Dole Whip in sight. Where is your favorite place to enjoy a Dole Whip? Disney weenies draw you deep into the park. The castle pulled you down Main St USA and as you turned to the left and started into Adventureland you would see the tall Tiki structure in the distance pulling you deeper and deeper into the jungle. Past the Swiss Family Treehouse and the backside of water. But what’s that you hear off in the distance, someone calling to you, a mermaid perhaps…. 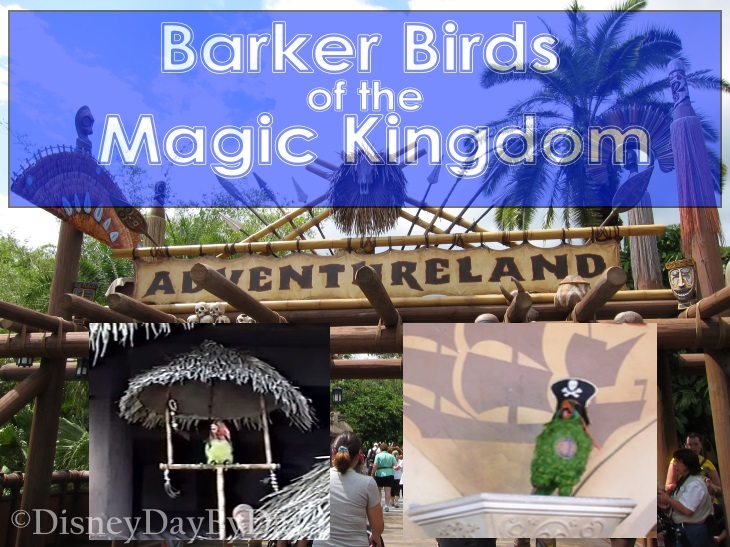 One of the ways that Disney got people interested in an attraction was the use of barker birds. Both Pirates of the Caribbean and the Enchanted Tiki Room had these barker birds enticing you to come inside and see what it was all about. “Avast there, ya lubbers! This be the place, if ya be seekin’ adventure and salty old pirates! (squawk) Salty old pirates, salty old pirates … (whistle) We pillage and plunder, rifle and loot, yo ho, me hearties, yo ho! (squawk). “Stop walking while I’m squawking! Aloha! It is time for me to tell you all about The Tiki Room.” These birds were such a hit in some cases they would draw their own crowds causing traffic jams and unfortunately their removal. At the Magic Kingdom, the barker bird stood outside the Pirates of the Caribbean until the rehab in 2006 when it was removed and moved to Downtown Disney (Disney Springs) in the pirates section of The World of Disney. Here is a look at the Pirates barker…. And the Enchanted Tiki Room barker…..
As you step out of the Magic Kingdom and look at the 30 or so bus stops and the non-stop bus traffic, it’s hard to imagine a time when buses were simply marked by a colored flag. This colored flag was all you needed to know about the bus route. 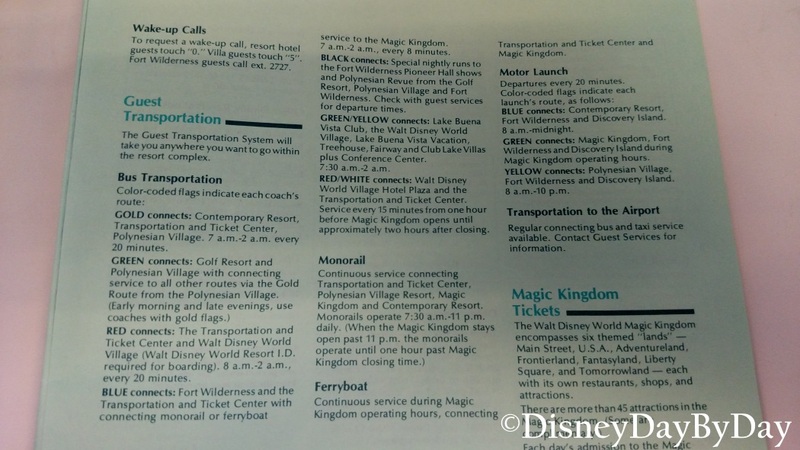 I remember watching for the blue flag bus to head back to Fort Wilderness and the Red to head down to Walt Disney World Village. They even required you to show your resort ID before boarding. 🙂 The few bus routes were Gold, Green, Red, Blue, Black, Green/Yelllow, and Red/White. You can see there route in our guide book picture below from out 1981 guidebook. Today you will find over 325 buses shuttling guests to locations all over the property. These buses connect the resorts to all the theme parks, water parks, and Disney Springs. From the moment you step off your plane, Disney will ensure you get to your destination. Through outside vendors, Disney has ensured you can get from the airport to the property and even to Disney cruise line without ever having to rent a car. We have enjoyed this efficient transportation on many of our trips, but we all know what it’s like to just miss that bus to the park you were going to in the morning. Disney is always looking at ways to make things better and bus transportation is one of them. If you have been to the parks recently you may have seen the new double articulated buses which allow for double the capacity of a standard bus. 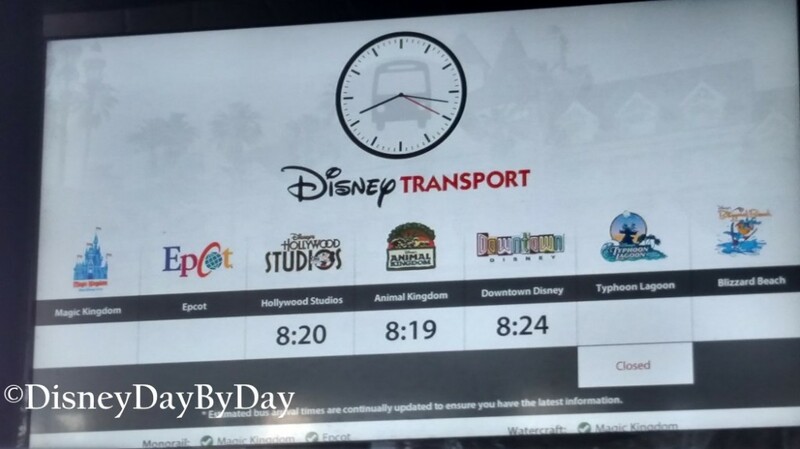 Some resorts also have wait time monitors (pictured below) and we have heard rumors that a new bus app is in testing with cast members which would be added to the My Disney Experience app. 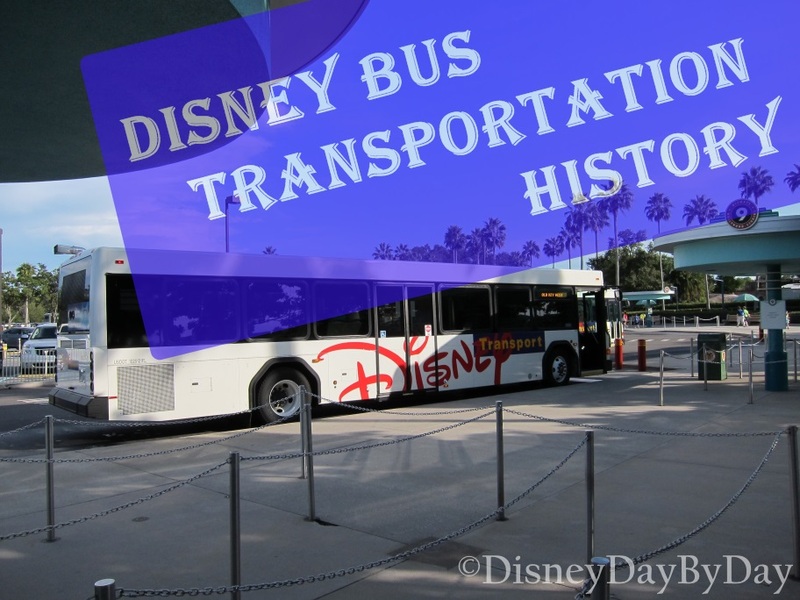 What is your favorite part of riding on Disney buses? One of my all-time favorite Disney movies is Pete’s Dragon. When I was a young boy I often pretended to have my own Elliott, yes he was the reason I was always getting into trouble. 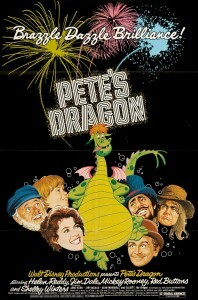 Pete’s Dragon, released in 1977 was the first Disney film to be recorded in Dolby Stereo sound. It was also the first Disney feature film to be released on VHS in October of 1980 (Be Kind and Rewind :)) The story is of a young orphan boy named Pete who stumbles into a town called Passamaquoddy, a fishing community in northern Maine. Pete has a dragon friend named Elliott who is only visible to Pete, causing Pete to take blame for everything Elliott does. The film was written by Malcolm Marmorstein and produced by Don Chaffey. Even though the film was set in Maine much of the filming was done in California, including the lighthouse scenes. For the lighthouse, Disney actually constructed a lighthouse in Morro Bay, CA. Because Disney wanted it to look authentic it was outfitted with a large beacon which required special permission from the Coast Guard. The film was nominated for many awards including Academy Awards for best original song. Last year Disney announced a remake of Pete’s Dragon. David Lowery has been announced as the director and filming is supposed to begin in New Zealand this fall. There have also been rumors of Robert Redford playing a town local who tells tales involving dragons that no one believes. What do you think, would you like to see a remake of Pete’s Dragon? The Sorcerer’s Hat, are you a lover or a hater? 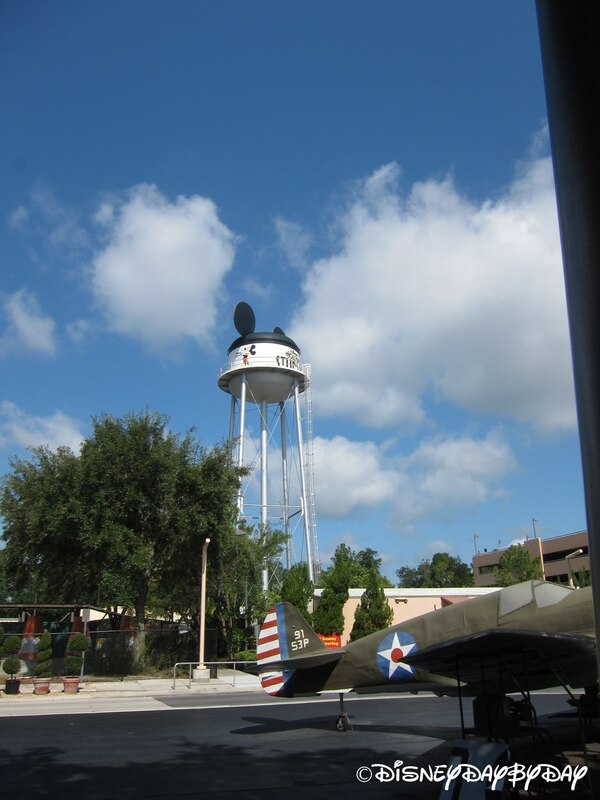 Disney recently announced the removal of the hat from Disney’s Hollywood Studios. The Sorcerer’s Hat will be removed in early 2015. I’ve seen many posts and articles about this topic and you can definitely see the divide of those that visited the park before it existed and those that had a first visit afterword. 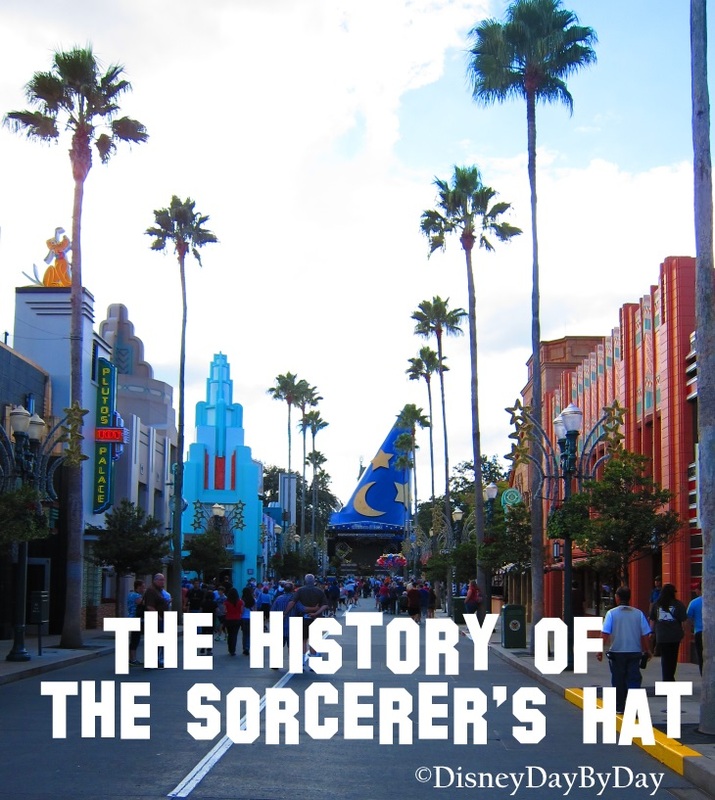 Let’s take a look at the history of the hat and the history behind it’s placement at MGM (Hollywood Studios). We were introduced to Sorcerer Mickey in the 1940 film Fantasia, in a role originally intended for Dopey from Snow White. The Sorcerer’s Apprentice is the third and most famous piece of this film. Mickey was working for a sorcerer master named Yen Sid (Disney backwards) and was learning to perform magic. Yen Sid went off to rest and Mickey “borrowed” the hat and became Sorcerer Mickey. His first bit of magic ended up with a flooded tower and Yen Sid coming back in to help. Since this film, Sorcerer Mickey has made many appearances in film/TV in The Mickey Mouse Club, Mickey’s 60th Birthday and House of Mouse. He can also be found in video games including Kingdom Hearts , Epic Mickey, and Disney INFINITY. And also theme parks including World of Color, Fantasmic, Mickey’s Philharmagic, and the weenie at the end of Hollywood Boulevard. 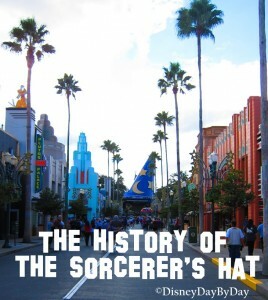 The Sorcerer’s Hat at Disney’s Hollywood Studios was erected in September of 2001 as part of the 100 Years of Magic celebration. It replaced the parks previous icon the Earful Tower. Under the hat you originally found kiosks you could go up to and learn more about Walt Disney’s life and career, today you find a gift shop. Before the Sorcerer’s hat visitors has a clear view down Hollywood Boulevard to the front of The Chinese Theater. Disney’s version of The Chinese Theater was an excellent copy of the actual theater in Hollywood which leads to the speculation on why the hat was put in front of it. In 2000 the Mann’s Chinese Theater in Hollywood changed hands and the rumor was that the new owners of the theater wanted Disney to pay royalty fees anytime they sold a picture to guests with the theater in the picture. So Disney put the hat up in front of the theater to avoid these royalty fees and block the theater from any pictures being taken down Hollywood Boulevard. So the hat will fall in early 2015. I’m a pre-hat visitor so I’m excited to see the original view we had down Hollywood Boulevard. Let us know if you will miss the hat in the comments below. We continue our tribute to Maelstrom this week as it sets sail this weekend. Let’s go back to when the ride was first being imagineered, what was this attraction going to be called? You are not the first to pass this way, nor shall you be the last. Those who seek the spirit of Norway face peril and adventure. But more often find beauty and charm. We have always lived with the sea, so look first to the spirit of the seafarer. Disney and the Imagineers were looking to bring the first thrill ride to EPCOT. As guests passed through the 1000 foot long flume ride they would encounter many mythical creatures including gnomes and trolls. The adventure would take you in search of the Rainbow Bridge to Valhalla. Valhalla is a mythical, majestic, and enormous hall located in Asgard. Our favorite Sherman Brothers were even engaged to develop the song for the attraction. How fun would that have been? As the ride progressed the Norway sponsors asked that the attraction be updated to contain more information on what Norway had to offer to promote tourism rather than mythological creatures/adventures. So the story line was changed to take guest through the history of Norway beginning with Norwegian Folklore and ending with modern day Norway (an oil rig?). 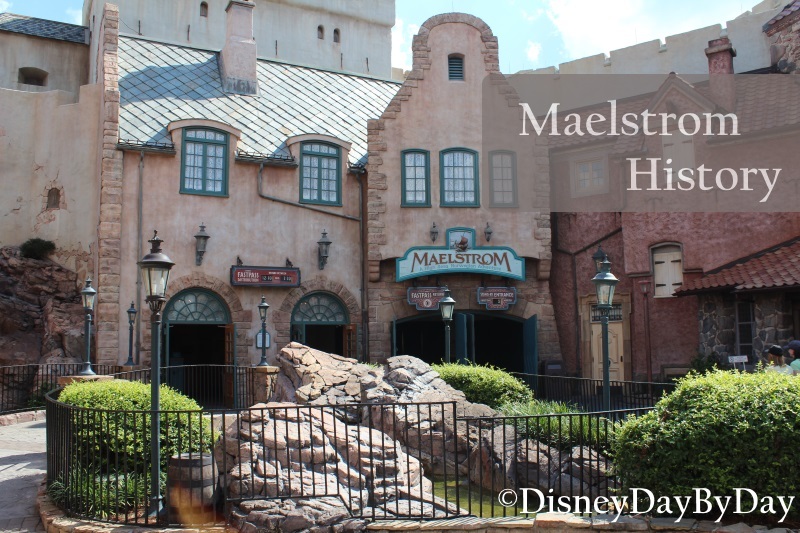 Maelstrom set sail on July 1988 and will cast off for the last time on Oct 5, 2014. Now to answer the question – Maelstrom was originally going to be called SeaVenture this was change even before construction started. How many of you remember the smoke affects on the original attraction, these were in a couple spots: the troll scene and in the area where the boat is reversed. These smoke machines were the largest on property at the time and really gave you that mythical feeling. 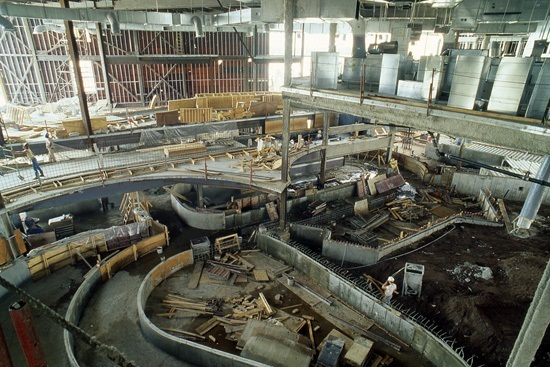 If you like history photos – click here for some from the Disney Parks Blog showing the construction of Maelstrom.